My families health is important to me so I have been trying to find ways to use our food to boost our health. One way I have been doing this is cutting sugars, reducing cards, and using fresh vegetables. I have found many recipes that my children love that I have been able to redo in a healthier manner. One recipe my kiddos love is a pasta salad that I make. It uses spaghetti or whatever pasta of your choice. Tortellini is amazing in this recipe. But for the purpose of making it lower carb I omitted pasta and instead used zucchini making it a healthy pasta salad. I bought a nifty new vegetable spiralizer that cuts any veggie and makes it into “pasta”, slices, and more. The healthy pasta salad that I make uses the setting that makes thick spirals. I use this blade because when I tried the thinner blade it made the zoodles too thin and they broke easily. When making this healthy pasta salad feel free to tweak it to your families nutritional needs. I have ommited the pepperoni for a meatless version. I have also used red wine vinegar instead of Italian dressing to give it a entirely new taste. 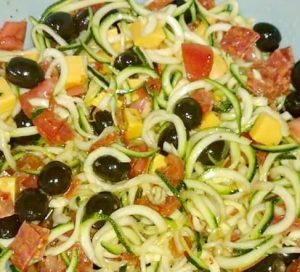 Use Spiralizer to make zoodles. You have 2 choices as far as salad dressing. You can make your own with olive oil, seasonings, and some vinegar or use a big bottle of Zesty Italian dressing. This sounds so good! We’re always looking for yummy low carb recipes. AND I love using the spiralizer. Can’t wait to try it! I love pasta salad! Can’t wait to try this one! Looks so good! I’m gonna go buy me one of the spiral things and try this.. This sounds delicious and at the same time healthy. I have to try it for my boys. Thank you. It’s so yummy all 4 of my boys ask for seconds and then will have it as leftovers.